Have you ever heard the saying, a man is only as good as his tools. Well, never has that proverb been more applicable than to our modern cookware. You give supreme consideration to the foods which enter your body, yet so little attention is paid to the kitchenware that cooks it. No matter how many organic foods you buy or how many healthy recipes you use, even the best of foods may be unintentionally transformed into poison by the pots and pans you use. Pots and pans come in many shapes and sizes; but unlike people, not all pots and pans are made equal. Understanding the composition of different cookware, and how its properties affect cooking is an important lesson that each cook is responsible for learning. Worst of all, using improper tools may not only have disastrous consequences for your health, it may also be damaging the taste of your food! Let’s take a look at the cookware that you should be avoiding. Ceramic-coated pots, pans, and cutlery can add a beautiful aesthetic touch to your kitchen, but they also add a toxic dosage to your food. They’re manufactured from various metals that are coated with a synthetic polymer which is softer than metal. This coating will only last about a year long, and its corrosion is accelerated by recurrent heating. High temperatures and mishandling threaten to crack or chip the ceramic material. When this happens, the glaze, which is laden with lead in order to provide shock resistance and color uniformity, begins to leach into your food. The concentration of lead is dependent on the specific manufacturer, but even a small quantity of lead is toxic to your system. Non-stick pots and pans make your cleaning job a lot quicker, but as the Tortoise and the Hare once taught us, quick and good are not always the same thing. Non-stick cookware is manufactured with a synthetic coating of polytetrafluoroethylene, a plastic polymer that begins to release toxins if heated above 450 degrees Fahrenheit. 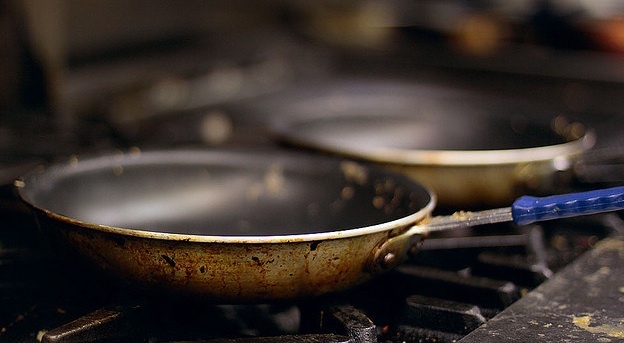 Teflon materials, such as non-stick cookware, has been linked to cancer and reproductive problems. Inhalation of the toxic fumes released from the synthetic coating can cause polymer fume fever, which causes chills, fevers, chest tightness, and mild cough. Don’t trade your health for convenience; every minute you save cleaning may be costing you more than one minute on your life expectancy. Aluminum is a basic staple of every kitchen, but it’s unknowingly been doing us harm for years. Aluminum cookware is commonly coated to prevent leaching, but the coating chips and deteriorates just like ceramic materials. The price to your health may be too high despite aluminum’s affordability. If, or should I say when the aluminum leaches into your food, it will accumulate in your brain, lungs, bones, and tissues, causing tangles in nerve fibers, leading to muscular dysfunction and potentially to memory loss – there’s medical debate whether aluminum buildup is a main cause of Alzheimer’s disease. The point is, save money elsewhere, and avoid aluminum like the plague. Copper pans are loved by many because of the material’s conductive properties that enable even and quick heating. But yet again there’s a price to pay for this convenience – are you noticing the pattern here? Uncoated copper will leach into your food rapidly, and protective coatings often contain nickel, which is extremely toxic and highly allergenic. Exposure to large quantities of copper in your food will suppress your internal zinc levels and weaken your immune system, disrupting your adrenal and thyroid function. Trust me, just keep the copper out of your food and leave it as a tip for your waiter. Coated Cast-iron pots and pans offer the same non-stick benefits of Teflon without the toxic fumes. They’re relatively easy to wash and require little maintenance. Best of all, they come in a variety of colours and styles! Bare cast-iron takes more scrubbing and greater maintenance than enameled cast-iron, but it’s less expensive and heats more evenly. It’s also capable of being submerged in an oven or a grill. It can also leach small levels of iron into your food when cooking acidic ingredients; however, this iron leaching will actually be beneficial to those who have an iron deficiency and require iron supplements. Beware though, even too much iron is dangerous for your health. Stainless Steel looks great, is non-stick, lighter than cast-iron, resistance to scratching or chipping, and lasts longer than coated materials – what’s not to love about stainless steel pans? Just like cast-iron and stainless steel, glass is a durable material that doesn’t deteriorate or release toxins into your food. Likewise, you should use glass storage containers instead of plastic containers. Ultimately, all cookware will release chemicals or toxins to a degree, it’s unavoidable given their unnatural and synthetic composition. The goal, however, is to minimize the threat of toxins entering your food. To do this you want to avoid those pots and pans that leach and breakdown easily, and replace them with highly durable materials that last longer and stay in proper condition. All cookware, though, should be replaced after a certain period of time, to ensure that you only cook with materials in optimal condition.